If you're heading towards Northern Jutland, Scandic Aalborg Øst enjoys a unique location close to natural resorts only 10 minutes from Aalborg city centre. This is a perfect hotel for your conference days. We offer free parking and our hotel is close to the motorway E45. Hotel Scandic Aalborg Øst has 101 newly refurbished hotel rooms – all comfortably furnished and many with a view of the beautiful nature around the hotel. We welcome you to our restaurant with a cosy atmosphere and a varied menu. You will get the gourmet experience whether you choose a casual business dinner, the special of the day or a light meal. The restaurant can accommodate 200 diners. The hotel is ideal for meetings and conferences. We offer 9 modern, flexible and bright meeting rooms that can accommodate from 2 to 300 people. Should you need some recreation and relaxation, we have a sauna, and if you need to keep in shape, then our well-equipped gym is worth a visit. At the hotel, you can also buy discounted tickets for the largest attraction in Northern Jutland, Fårup Sommerland. If you need to park your car, we offer free parking for approximately 70 cars. If you are headed for Northern Jutland and time is of the essence, then Scandic Aalborg Øst is the ideal choice. The hotel enjoys a convenient location as it’s easy to find right by the motorway E45 and just 2 minutes’ drive from Aalborg Gigantium, a culture and sports centre, hosting events such as important handball matches. At the spa at the sports centre, you also find time for self-indulgence. Hotel Scandic Aalborg Øst is also located conveniently if you plan a visit to Skagen, Blokhus, Løkken and the many attractions in Northern Jutland. Aalborg city centre with entertainment and shops is a 10-minute drive away from the hotel. You’ll find Scandic Aalborg Øst 10 minutes from Aalborg city centre. 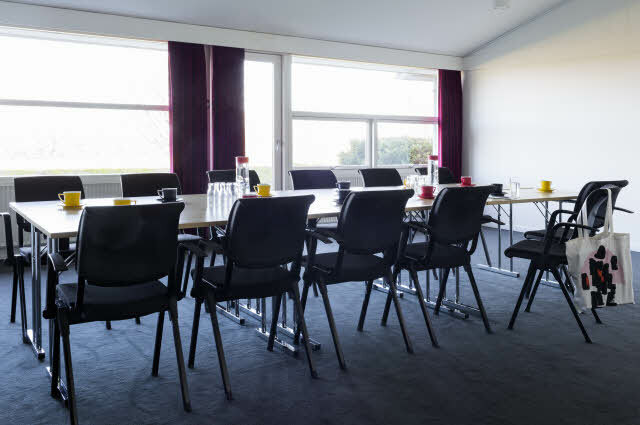 Our hotel is perfect for meetings thanks to its location right by the E45 motorway. We offer 9 modern and light meeting rooms which can accommodate 2–300 people.